She’s not leaning anymore obviously, originally designed by sculptor Albert Roze and dubbed the ‘Golden Virgin’ – she stands holding aloft a golden baby Jesus on the very top of the Basilica of Notre-Dame de Brebières in the middle of Albert. In fact she’s very shiny and golden and you can see her for miles around certainly from La Boisselle and beyond towards Poziere. Why was she called the leaning Madonna? A short explanation; The Madonna of The Basilica was shelled, well the tower was by the Germans. Mainly because it provided a good point for artillery spotters to view the front over the high ground which otherwise blocks the view of the front line and mercifully protected Albert a little bit. So they fired at it and knocked the Madonna over, so she leaned a bit, gradually she leaned a bit more until she was virtually horizontal, probably about 4 o’clock by the little hand actually. A lovely little mind trick that us humans do sprang up around it; the troops as they marched below heading to the front glanced up at this symbol; a woman with a golden child, and quickly inflated a new superstition along with the other protection thing we do, basically it goes that should the Madonna fall the Germans would win/take Albert/A monkey would be fired into space etc. so as to avoid any depletion in the morale of the troops feeding the mincing machine to the East some resourceful Royal Engineers climbed up the tower and attached the Madonna without the big boobies to the tower using steel cable making damn sure she wasn’t about to plunge to her and therefore their doom and that is how she remained for a year or so, just sort of leaning there nonchalantly holding out Jesus at a bizarre angle while hot metal whizzed about maiming people taking chunks out of the buildings in the locale and generally making life either miserable or quickly over. I love Albert, but it is a strange little town; It’s doesn’t appear to have the verve of Ypres, it feels more reserved, maybe the town resting in the enveloping arms of the green downs of the Somme thinks some things are best forgotten, there are obviously a lot of memories that don’t or won’t fade. You get a feeling in The Ypres Salient in Belgium that the war is embraced as part of the temporal landscape and us with it; you are very much welcome as an English speaker; it is a large part of the local tourist economy, you feel welcome practically everywhere you go; everything is signposted referrenced and easy to find. I’ve lost count of conversations with Flanders residents about why I’m there, which in several cases, two in particular have resulted in a ‘let me show you something’ with a box of Great War trinkets being displayed in a Café in Messines by an owner was one quarter a Scot, her grandfather fought out there and went back after the war, or a ‘Let me tell you a story’ which is followed by a complicated account of some detail of a battle I’ve never heard about by a Flemish man with a flared moustache, ample stomach and flailing arms gesticulating at a line of trees at a Café in Hooge as we both stood outside having a smoke. Albert somehow seems different from a local perspective, not unfriendly at all, just removed somehow, like that ridge of soft green rolling downland that isolates the battlefields from the town, I just felt slightly more at arms length from the locals. I think they just want to get on with life more and not look back so much, and has spat out a lot more of the gristle that makes Ypres so much more snug for us wanderers along the front. Except it has amongst other things The Madonna, something symbolic of that struggle the Empires had. Irony of course comes into play here, eventually during the Spring Offensive in March 1918 the Germans took Albert complete with the leaning Madonna, referred to with a shrug as ‘Michael Jackson’ by my charming then twelve year old son, when I asked him if he knew who the figure holding a child above it’s head was; he then made a joke about Lego and Michael Jackson that I won’t repeat but it made me and him laugh as we stood outside peering up at her, and as a plus point got that special ‘you’re being inappropriate’ look from my wife that means it was definitely a good joke. As you would expect the tower was again used as a spotting tower only this time by Anglo-Saxon men in field grey, so in return the British used it as a target for their artillery on it and knocked it clean off. Then of course we took it back as you do in the very slow slogging ebb and flow of battle and so it goes until most people were dead or maimed or psychologically damaged, everyone else went home for tea. 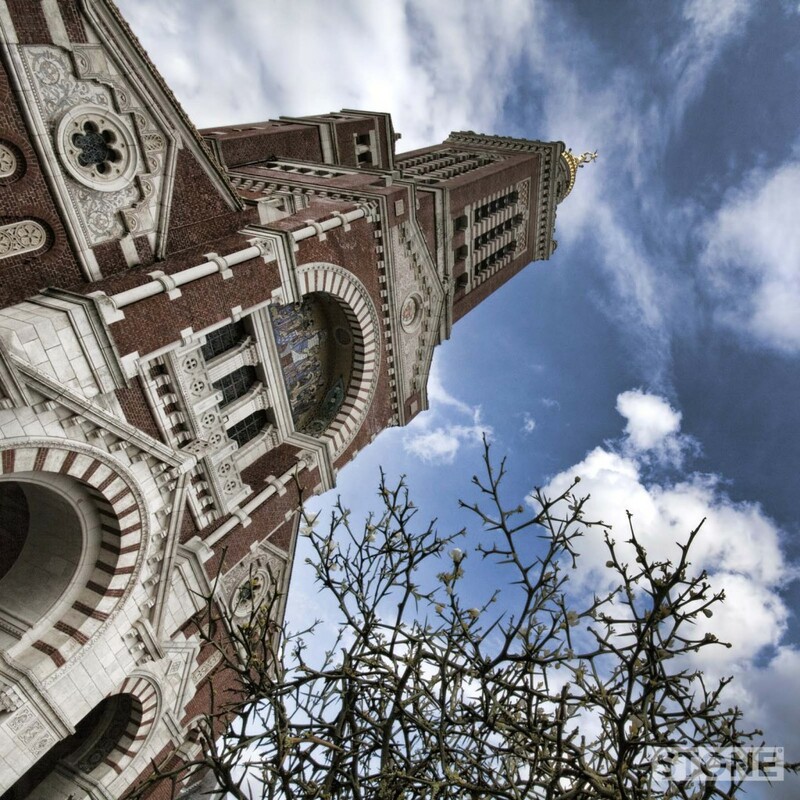 The Basilica was rebuilt by Eduoard Duthoit the son of the original architect faithful to the original plans from the 1880s. Incidentally in front of it are thorn bushes. A nice little statement to make around a Catholic Basilica and redemption and pain and forgiveness. 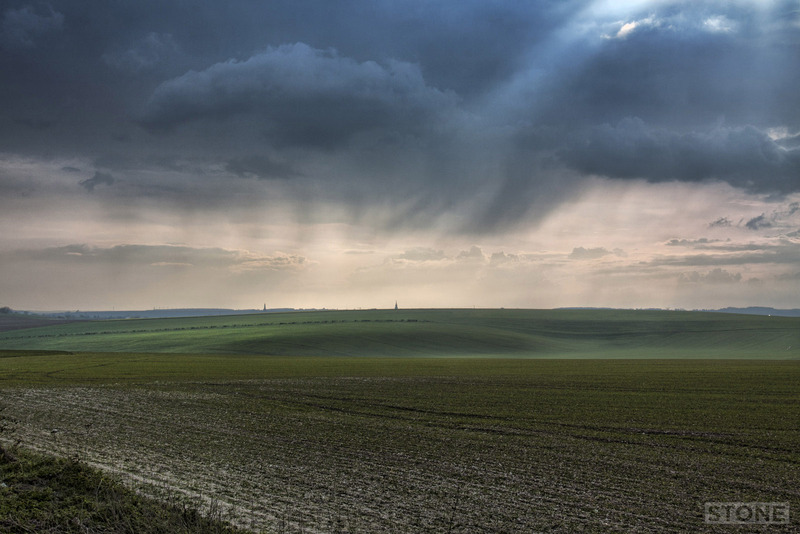 Top Photo: Albert from La Boisselle, looking across Sausage Valley. 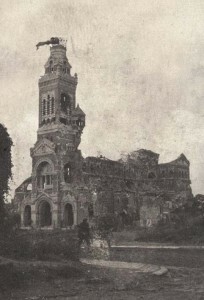 Inset photo: The Basilica in 1916. Bottom photo: The Basilica 2012.